In 1328 AD, the king of France died without a son, and his cousin became King Philip VI. But many people thought that the old king’s grandson, the son of the king’s daughter Isabella and King Edward II of England, was a better choice. 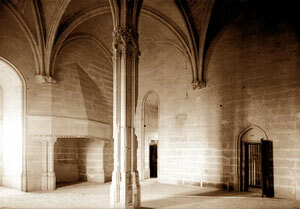 King Philip was worried that someone might try to kill him if he lived in the Conciergerie in Paris. And then in 1337 King Edward attacked France and began the Hundred Years War over which of them should be king of France. Philip decided to build himself a really strong castle at Vincennes, outside of Paris, where he could be safe. He built the big keep (tower) you see in the picture. It’s built to keep out enemies. There’s no entrance on the ground floor at all – you have to climb a narrow staircase in the outer wall and then cross a wooden drawbridge on the second floor. All the windows are just narrow slits you can shoot arrows out of. The same thing happened to Philip’s grandson, Charles. In 1358 AD, the people of Paris rioted, led by Etienne Marcel. The Hundred Years’ War was still going on, and King John II of France was a prisoner in England in 1358, so the rioters met in the Conciergerie with John’s son, Prince Charles, who was only 21 years old. In front of the horrified prince, the rioters killed two of his advisers. Charles had to run away from Paris to save his own life. When Charles became King Charles V six years later, one of the first things he did was to move out to his grandpa’s castle at Vincennes where he could be safe. Charles fixed up Vincennes to be a nice place to live, with fireplaces and wood paneling in all the rooms. But the kings didn’t live in Vincennes very long. Even before the Hundred Years’ War, people in Europe learned how to make gunpowder. By the late 1300s they had invented cannons so they could blow holes in the walls even of strong castles like Vincennes, and kings gave up and stopped building and living in castles. Learn by doing: aprojectabout castles. Cite this page: Carr, K.E. Vincennes Castle – Paris. Quatr.us Study Guides, July 31, 2017. Web. April 23, 2019.